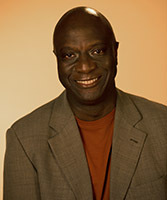 James H. Salley is the Associate Vice-Chancellor for Institutional Advancement for Africa University. With more than 22 years of higher education administration experience, with offices both in Nashville at the General Board of Higher Education and Ministry and the university site in Old Mutare, Zimbabwe, Jim has been in ministry with Africa University since its inception. He has helped individual and corporate donors, local churches, annual conferences, and general agencies of the United Methodist Church connection and beyond understand the mission and needs of the "School of Dreams". Jim serves as the chief advancement officer and fund raiser for the institution; he is in charge of the University’s institutional advancement program; and he is responsible for interpreting the programs of the University to local churches, organizations, and agencies throughout the United Methodist connection and beyond. 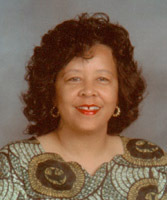 Elaine Jenkins is an attorney and an active member of the South Carolina Bar Association. As the Director of Planned Giving for the Africa University Development Office, she works with donors (and sometimes their advisors) who are interested in including Africa University in their estate plans. ..."From everyone to whom much has been given, much will be required; and from the one to whom much has been entrusted, even more will be demanded". This verse informs all that Elaine does and is the principle by which she lives her life. 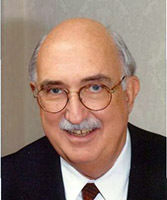 Bishop J. Lawrence McCleskey joined the AU Development Office in 2008 as Executive Vice President. He works with bishops and annual conferences that want to do campaigns for Africa University and call on individual donors, focusing on building endowment for scholarships and capital projects. An active United Methodist clergyman for 45 years, Bishop McCleskey’s first Episcopal assignment was to the South Carolina Conference. “We did a campaign for Africa University and Hope for the Children of Africa and raised $2.5 million,” he recalls. 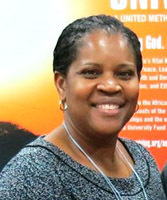 Glorianna McClain, Executive Assistant to the Associate Vice Chancellor for Institutional Advancement, joined the staff of the Africa University Development Office in August, 1994, after having worked for eighteen years with the General Board of Higher Education and Ministry's Black College Fund. Glorianna is responsible for managing the U. S. office, maintaining financial records and reports and the Raiser's Edge Database System which has over 18,000 personalized records of constituencies. She also works closely with the Associate Vice Chancellor in helping to maintain a constant communication between the staff in Zimbabwe, our supporters and friends of Africa University. 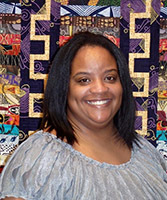 Andra Stevens serves as director of communications and creative services in the AUDO. She has been with Africa University since March 1995—working in communications, public affairs and institutional promotion from the main campus in Zimbabwe until her transfer to the AUDO in Nashville in late 2011. 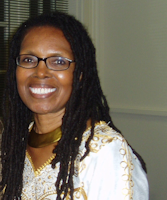 Prior to joining Africa University, Ms. Stevens was a full-time journalist and worked in television and print media in Canada and East Africa. She has also worked with the United Nations in the areas of human rights and the environment. Shetieka Darvin: When you contact the Africa University Development Office, nine times out of ten, the voice on the other end of the line is that of Shetieka Darvin. She joined the staff in November 2011, after working as a Data Entry Clerk for Genworth Financial and as an Office Assistant for the Metropolitan Nashville Public Schools. As an Office Coordinator, her responsibilities include receiving and making thank you calls, data entry, maintaining the database, mailing acknowledgement letters and resources, and other duties as assigned. She graduated from National College of Business and Technology in 2007 with an A.S. in Computer Applications Technology. In 2012, she received her B.S. in Information Systems Security from ITT Technical Institute.